[Written by Ian Henderson] Who recalls the Whitney Sevens Rugby tournament for all the island schools back in the 60’s and thru to the 90’s? Ollie McKittrick, a former staff member at Whitney (1960-71) and instigator of the Whitney Sevens recalls the history of the tournament from the 1973 Whitney yearbook. This week is the 50th anniversary of the Whitney Sevens. It all started in late October 1960. The boys of form five were all Americans from either Kindley Air Base or the Naval Station in Southampton and their main interest was in American Football. For the next three weeks Ollie played American Football with the boys and eventually convinced them to watch a game of rugby. They came back from the rugby game itching to learn the game. and they started training in earnest with the biggest problem being the forward passing and blocking! The P.E. staff at Saltus, Warwick and Whitney embraced the concept of growing rugby in the schools and it culminated with an end of season rugby sevens tournament. 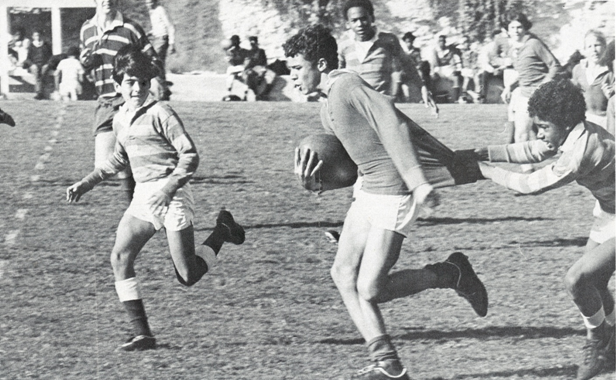 The First Whitney Sevens tournament began on St Valentine’s Day 1961. There were five teams in the tournament, two from Whitney, two from Warwick and one from Saltus. The Whitney A side won the tournament, captained by Tim Blagg. The number of teams grew steadily from 5 in 1961 to 32 in 1973. There was a revival of this entertaining rugby format at Somersfield Academy on December 9th 2010. The Sevens tournament had participation from the following schools at three age groups (U12, U14 and U16) – Sandy’s, Saltus, BHS, Somersfield with Whitney Institute and Bermuda Institute also having players represented on the teams above. The event was well attended by parents, friends, students, coaches and school teachers and the core values of rugby union (teamwork, discipline, enjoyment, respect and sportsmanship) were on display throughout the tournament. The games were both competitive and played in a good spirit with all players taking pride in representing their schools.